12 Days of Giveaways! Day 10! GorillaPods love to party and we think there is no better way to ring in the holiday season than with lots of awesome giveaways! For twelve days starting December 3rd, we’re giving away a different prize every day! Prizes include all of our new products like the GripTight iPhone & Android tripods and Camera Straps, plus some great gear from Cinetics and Olloclip and GorillaPod and GorillaTorch favorites. 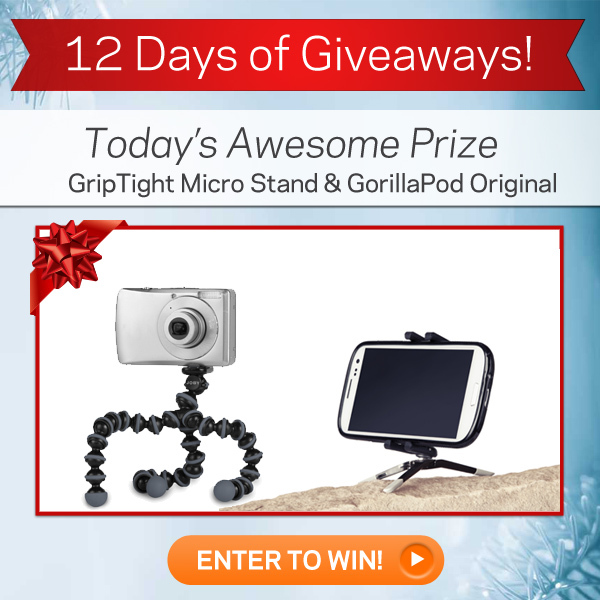 Enter for your chance to win a GripTight GorillaPod Stand, UltraFit Sling Strap, GorillaPod SLR-Zoom and more! GripTight Micro Stand for iPhones and Androids and a GorillaPod Original in the color of your choice! Because it’s the smallest smartphone stand ever, you’ll never leave home without your GripTight Micro! Take the GripTight Mount off the GripTight Micro Stand and put it on your handy GorillaPod for even more positioning possibilities! GorillaPod Original is also perfect for point & shoots! Enter to win one today!